This is a reaaaalllly old blog but the principles are still true! Also, the Content Planning video training series mentioned below is available in the free membership tier of Pinterest PowerUp. I have yet to talk to a single business owner who thinks they don't need to be on social media at this point. They know it's essential for their brand or business and have usually put some nominal effort into building their audience on a few social media networks. But I do hear the same thing consistently from entrepreneurs who feel like social media isn't working for them. "Meh. I'm not getting clients/customers. I don't even know if what I'm doing works. I don't know what to post. I just don't have time." You are hustling to take care of your clients and never-ending to-do list. You are trying to be innovative and stand out in your industry. You are trying to keep track of your financial books and deliverables. Who has time to read about the latest Facebook changes at 10 PM when your grasp of the platform is dicey at best? When I do an assessment of a business' social media presence, I see the same issues over and over that are strategy killers. Chances are your business is a great fit for 2 or 3 social media networks - not 5 to 7. I see businesses have social media accounts just to have them, and they are posting the same content across all networks. People know when content has been auto-posted from one account to the next, which begs the question - if you post all your Instagram photos to Facebook, why would someone follow you on Instagram? Figure out where your target audience is spending their social media time, and pick the top 2 platforms to focus on. Learn those networks, best practices, image sizes for posts, etc. You need to have an intermediate level of understanding on those platforms before you even consider expanding to another social media network. Focusing on 2 platforms will also help you form better social media habits and not be stretched so thin for content creation and time. If you've already taken my free video series: Content Planning for Rockstar Solopreneurs, then you are well on your way to fixing your social media strategy. You've probably seen those accounts on Twitter or Facebook that post a whole bunch for awhile, and then drop off the face of the earth. Then they come back to sell something, post a few times, and then are gone again. Your audience needs to know you're there and you take your business seriously. If they see you have a tendency to disappear, they are not going to come looking for you. You don't have to post every day - even once a week is fine - just be consistent and provide value. If people are leaving comments, asking questions, and/or sharing your content - you MUST respond. In a world where peoples' attention spans are shorter than ever and brands are fighting for audience interest, the biggest gift a fan or follower can give you is their time. If they took the time to engage with you, you had better engage right back - or you'll lose brand equity and potentially a customer. Even if someone leaves you a negative review, that should be seen as your opportunity to showcase your awesome customer service and make things right. There are a myriad of apps/sites out there that can help you keep track of engagement, such as Mention. Most social media networks will notify you within their app if you have new activity on your account. Schedule 5 - 10 minutes every couple days to check. It looks pretty weird when a business - for example a hair salon - randomly posts a food recipe they like. It screams "unprofessional owner" and confuses your audience. Pick 3 ideas or concepts that speak to your business and expertise and commit to sticking to those topics. For example, I post about social media, productivity, and entrepreneurship. The occasional funny meme or cartoon is totally cool, and can get great engagement while breaking up your content a little - but keep it sparse unless funny memes are a characteristic of your brand. The other "no strategy" mistake is when brands don't know how they are going to use each social media network they are on in a specific way. Each platform attracts different audiences and demographics. Different types of content are going to resonate differently on each platform. For example - I use Facebook for really meaty, valuable content, Twitter to share tons of articles and how to's, Instagram as my most personal, daily life network, etc. Know how you want to use each platform and what you want to share. I do not mean scheduling your posts - which can and should be done for your sanity - I mean when content automatically pushes from one platform to another. I often see this from Instagram to Facebook and Twitter. There are two issues with this - 1) your audience has no reason to follow you on another platform if you always post the same content somewhere else too, and 2) each platform works differently and image sizes and tagging/hashtagging will not be the same (read: ineffective). This goes back to knowing your strategy on each platform. If you don't have anything unique to post on a platform, chances are you shouldn't be on it. The one exception I utilize is an IFTTT recipe that posts my Instagram pics natively to Twitter. What the hell does that mean you ask? If you auto-post to Twitter from Instagram, only a link back to Instagram shows up, instead of the picture. Through the IFTTT recipe, the picture will show up, which is proven to elicit more engagement on Twitter. For a detailed explanation on how to do this, read this blog. 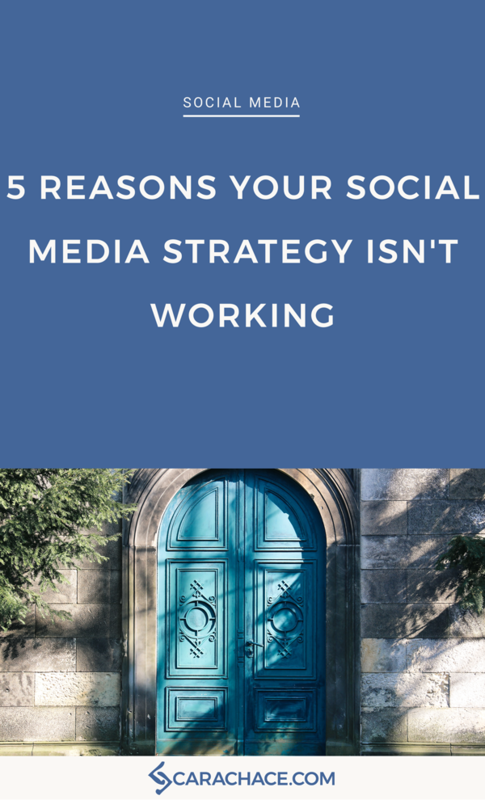 I absolutely guarantee if you fix these 5 mistakes your social media strategy will turn around and start gaining traction.